This cranberry cinnamon cornbread recipe is made for fall. Cornbread loaded with craisins and cinnamon — it’s the perfect side to a hearty chili or crockpot dinner. Serve warm and top with butter and honey. My kids have been asking about snow for several weeks now. They were so excited to see the snowflakes. And now they think Christmas is coming soon. Slow down time, this momma is not ready for Christmas yet! 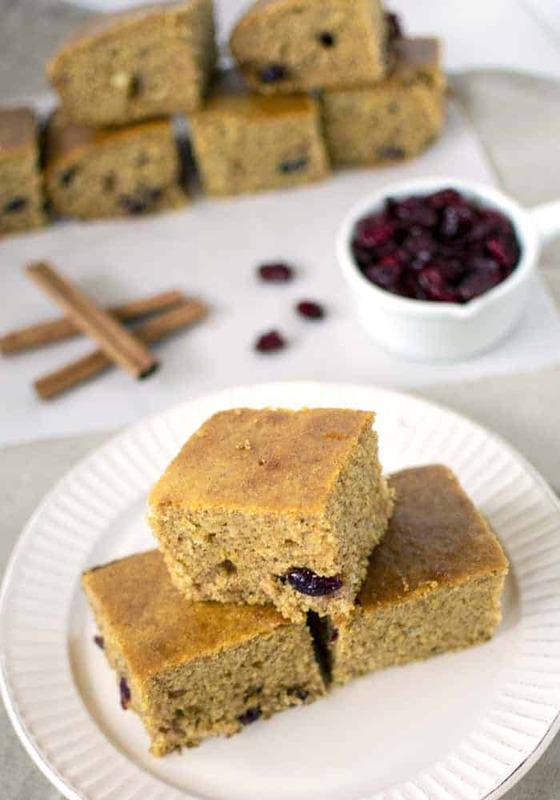 But either fall or winter, it’s the perfect time to whip up a batch of this cranberry cinnamon cornbread. And pair it with your favorite hearty soup. We love this cornbread with homemade chili. We really don’t make “normal” cornbread very often anymore. Once you add craisins and cinnamon it’s really hard to go back! Then melt the 1/2 cup of butter in a small bowl. Measure the granulated sugar into a medium-sized bowl. Next, add the melted butter and mix well. A tip on the buttermilk: If you’re looking at this recipe and thinking “I’ll just try regular milk instead of buttermilk” — make sure to add a buttermilk substitute. Otherwise, your cornbread will not rise properly. And it will be very dense and not cook properly. The mixture needs acid to activate the baking soda. On another note, the buttermilk and eggs should be at room temperature. To achieve this, add both the buttermilk and the eggs to a liquid measuring cup or small bowl. Microwave for a few seconds until the temperature of the milk feels lukewarm. Blend the butter mixture with the buttermilk and eggs. Next, mix all dry ingredients together (flour, cornmeal, baking soda, salt, and cinnamon). Then add all of the dry ingredients to the wet mixture. Mix well. Finally, add the cornbread batter to a lightly greased 8 by 8 baking dish. Bake 22 to 25 minutes at 375 degrees. The top of the cornbread should be golden brown. And when you insert a toothpick into the center of the bread, it should come out clean. Cut the bread into 9 pieces to make perfect serving sizes. Top the warm cornbread with butter and honey, if desired. 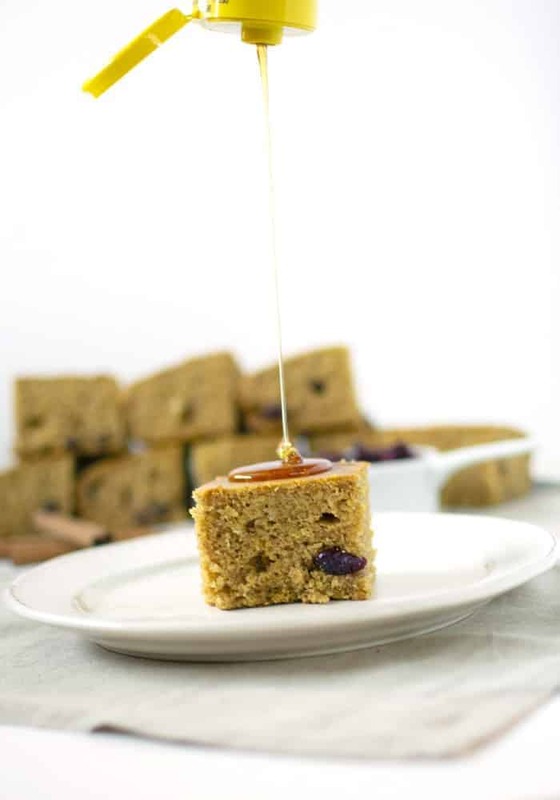 Although this cornbread is delicious, no toppings needed! Please stop by in the comments, and let me know what you think of this cranberry cinnamon cornbread recipe! Cornbread made for fall. It’s loaded with cranberries and cinnamon. Or leave those ingredients out for traditional cornbread. Add the melted butter, granulated sugar to a medium-sized bowl and mix well. The eggs and buttermilk should be room temperature. To achieve this temperature add the buttermilk and eggs to a small bowl or liquid measuring cup and microwave for a few seconds until lukewarm. Add the cornbread batter to a greased 8 by 8 baking dish. The bread should be golden brown and when you insert a toothpick, it should come out clean. Cutting the bread into 9 pieces make for nice serving sizes. Top with butter and honey, if desired. 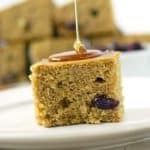 Be sure to use buttermilk in this recipe (or a buttermilk substitute). You need the acidity from the buttermilk that regular milk does not have. You can put the buttermilk and egg in the microwave for a few seconds to reach room temperature. Serving warm from the oven is so delicious.